Griffin R. Leitch is a licensed attorney and has been practicing law in Minnesota since 2014. He is a 2011 graduate of University of North Dakota, Grand Forks, ND, with a B.B.A. in business management and a minor in sports business. He graduated from William Mitchell College of Law, St. Paul, Minnesota in 2014, where he participated in a family law residency at Central Minnesota Legal Services, volunteered at the family law self-help clinic and was a Mitchell Mentor. Griffin first began working at our law firm as a law clerk in the summers of 2012, 2013 and 2014. He then joined our firm as an associate attorney in October 2014. 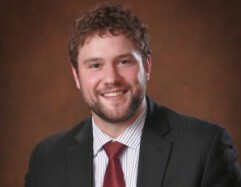 He grew up in Willmar, MN, graduating from Willmar Senior High School in 2007.Griffin is licensed to practice law in the State of Minnesota and the United States District Court, District of Minnesota. He is also a member of the Minnesota State Bar Association. Griffin is married and resides in Willmar, Minnesota. He is an active member of Willmar Kiwanis, currently chairing the Service Leadership Committee. Griffin also serves as a YMCA board member, a United Way board member and is a member of the Benson Chamber of Commerce.